First responders from the USAG Bavaria Fire Department asses and treat victims of a simulated active shooter during a full scale exercise held here July 15, 2017. The victims were played by volunteers from across the installation who donated their Saturday to help the garrison test the responses and standard operating procedures it would implement in the case of a real-world emergency. Disclaimer: All injuries are simulated. Photo by Juanita McClellen, USAG Bavaria Public Affairs Office. GRAFENWOEHR, Germany — Smoke rises from the middle school just as military police arrive on location. Meanwhile, 150 DOD personnel out of Turkey are en route to a shelter here as part of an evacuation operation. And garrison employees suddenly realize they’re the target of a malicious and sophisticated cyberattack. It’s like a scene out of a dramatic movie, but it’s not. This is how the largest Army garrison overseas trains to fight. 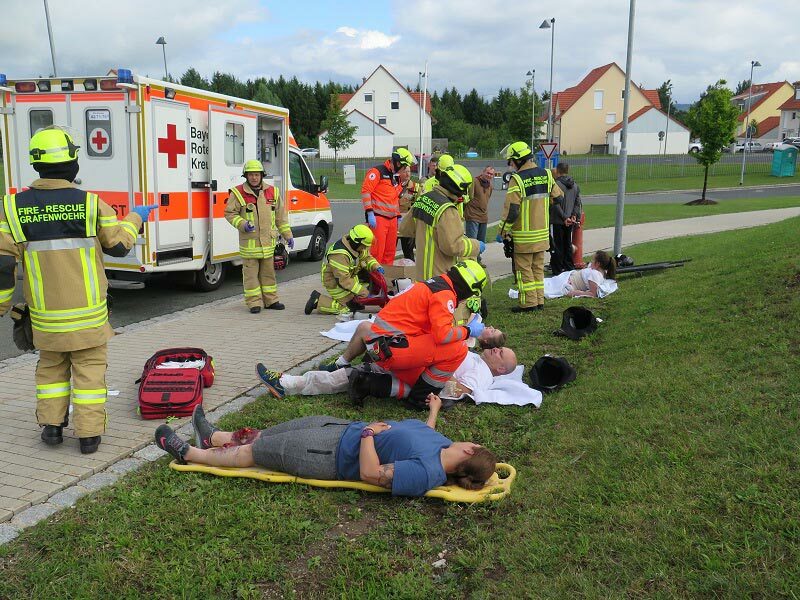 This force protection exercise conducted over the course of a week in mid-July tested U.S. Army Garrison Bavaria staff and first responders in emergency management. Additionally, the exercise strengthened relationships among various DOD agencies, host nation key leaders and media. All this was done to assess and identify gaps in the garrison’s crisis responses and standard operating procedures. The exercise kicked off with notice of a noncombatant evacuation operation, or NEO, and ended with a full day of responding to different crisis scenarios. The NEO portion of the exercise directed 150 DOD personnel from Turkey to a shelter located at USAG Bavaria’s Tower Barracks, due to unstable conditions in that area. While the workforce was busy with the NEO, another scenario kicked in: Several enticing phishing emails had been pushed to many garrison employees. Camouflaged as MWR marketing emails, it was not easy to identify the scam message. At the end of the day, eight employees and their computers fell victim to the sophisticated scam — a real-world possibility and a valuable lesson for garrison employees. At the height of the exercise, an active shooter had infiltrated Netzaberg Middle School on-post. But military police “neutralized” the shooter and discovered an improvised explosive device tucked inside a book bag. The garrison’s explosive ordnance disposal team quickly secured and destroyed it moments later. After eight hours, the active shooter was neutralized, the bomb disarmed and everyone could breathe freely.